Amazon Echo Dot review | What Hi-Fi? With Amazon now a $1 trillion company, the days of simply selling second-hand books seem a distant memory. The company now not only sells pretty much anything you can think of, but has also made serious strides into making its own hardware and software. 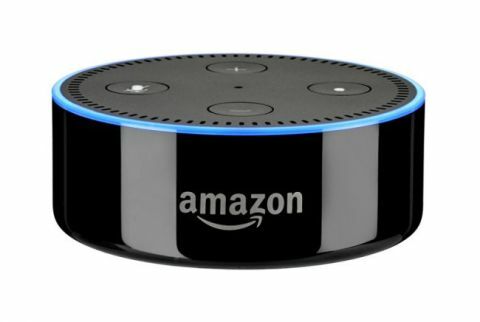 From tablets to streamers to wireless speakers equipped with the Alexa voice assistant, Amazon now has large fingers in most of the home entertainment pies, and this, the second-generation Echo Dot, is its most affordable entry-point. That remains one of its biggest selling points. If you want to dip your toe into the word of a voice-controlled virtual assistant, this is an affordable way to do it - but do bear in mind that there's now a newer version available for not a lot more money. The Echo Dot works as a standalone voice-controlled device, giving you access to everything Amazon's Alexa assistant can do. Skills at your disposal range from the basic ones, such as news and weather updates or controlling your music, to more advanced skills including ordering a minicab or a pizza, turning on Netflix on your TV, making video calls and controlling your heating and lights. While much of the former is available straight out of the box, the latter relies on you having compatible devices in your home. Either way, the list of Alexa features is only going in one direction – and a key Amazon strength is certainly the breadth of compatible hardware manufacturers and services onboard. Alexa certainly leads the way in this regard even compared to Google Assistant or Siri devices. Getting started here is simple. Connect the Echo Dot to your wi-fi, download the Amazon Alexa app, and warm-up your vocal cords. The Echo Dot has no fewer than seven microphones to make sure it can hear you in even noisy rooms, and a tiny speaker for playing commands and music. It's certainly pretty good at hearing commands – much better than the first wave of voice-activated devices – but the audio quality of the speaker really isn't great. It's okay for hearing basic responses, but not for listening to music. If you want to use it with any regularity as an audio speaker, it really is worth spending the extra £50 on the new Amazon Echo. If you're ambivalent about ecosystems, then the audio quality on the comparably priced Google Home Mini, even for speech, is noticeably fuller and more detailed. Where the Echo Dot makes more sense is connecting and controlling other devices, adding voice support to your hi-fi or home cinema system. The 3.5mm output and Bluetooth functionality allow you to send music to and from the Dot, and build a basic multi-room system to play music simultaneously across multiple Alexa devices. Supporting brands include Harman Kardon, LG, Onkyo and Sonos. For more complex commands, you need to be careful with your line of questioning. Alexa can be thrown if you don't approach the question quite how it expects. We certainly haven’t yet reached the conversational stage of AI devices – this is still more call and response than natural sounding chat. While Alexa is ahead when it comes to compatibility with other devices and services, we think the Google Assistant, found in Google's Home devices, is slightly ahead when it comes to search-based queries – though with Google, that shouldn’t really be a surprise. What you see is largely what you get with the Echo Dot, and that's a good thing. It's an affordable voice assistant, which now understands you better than ever, even if it doesn't itself sound particularly impressive. For voices, it works fairly well, so if you're looking to add voice control to your home or entertainment system, it's hard to argue against the Amazon Echo Dot as an affordable proposition - particularly as it's now available for £10 less than its original asking price. But do also consider the new, third-generation Dot, which looks prettier and, according to Amazon, sounds better.